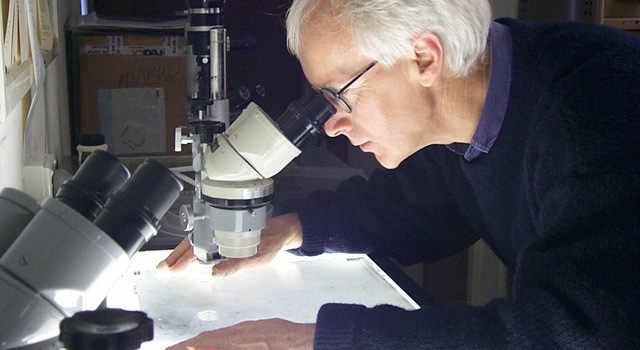 Over the last 40 years, Malcolm Hartley has done just about every possible job for Siding Spring Observatory's UK Schmidt telescope in New South Wales, Australia. The British-born, Scottish-educated Hartley has logged time as the 1.2 meter (3.9 foot) telescope's observer, processor, copier, hypersensitization expert, and quality controller. On the afternoon of March 16, 1986, Hartley's job was that last one -- quality control. In that role, he was the first to view each 36-by-36 centimeter (14-by-14 inch) photographic glass plate after it had been exposed to the night sky. Checking for imperfections on one of the previous evening's 60-minute illuminations, Hartley came upon something that wasn't supposed to be there. "Back then, the observations came in as negatives -- stars and other objects in the sky appeared black on a clear background," said Hartley. "I noticed a dark haze around a trail. Trails indicate something that is traveling fast through the sky, but asteroids don't have a haze. So I thought it might be a comet." Hartley double-checked his sighting a couple of nights later, then submitted his findings to the Minor Planet Center in Cambridge, Mass. A couple of days after that, the center issued a brief circular informing the astronomical world of the discovery of comet Hartley 2. "I was very happy for a couple of days," said Hartley. "Every scientist wants to discover something and it's a fantastic feeling. There was even a mention in the local paper, the Coonabarabran Times." On the world's stage, having a comet named after you is certainly unique. But not so much in the small town of Coonabarabran -- which they say comes from the local Aboriginal word for 'inquisitive person.' It is the closest town to the Warrumbungle Range and Siding Spring Mountain and the Anglo-Australian Observatory. "There are several other colleagues at Siding Springs who have discovered comets," Hartley said. "Robert McNaught has discovered over 50, and I don't think he's ever been mentioned in the Times. It's a rural farming community, and while there are amateur astronomers in the area, finding comets is not really a big deal." Hartley went on to discover or co-discover 10 comets with the UK Schmidt telescope, and with each, he would feel an initial rush of excitement. But in 2002, the Anglo-Australian Observatory retrofitted its Schmidt to perform multi-object spectroscopy, essentially halting all astrophotography with the telescope and ending any future possibility for comet discovery. Hartley, who never was directly tasked with finding comets, continued to work the telescope's galaxy surveys. Comets, it seemed, had become little more than a historical footnote in his career. That is, until he got a call from a science magazine. "At the beginning of last year, a reporter emailed and said that the EPOXI mission changed its target and now it was going to go to Hartley 2," said Hartley. "I didn't even know Hartley 2 was one of the two comets under consideration." Hartley 2 was definitely on NASA's very short list of potential comet targets. The only problem with Hartley 2 was it would take more than two years of extra deep-space cruising to get there. So the only other candidate on the short list, the similar-sized comet Boethin, was selected. That is, until it disappeared. Scientists theorize that comet Boethin had broken into non-traceable fragments. 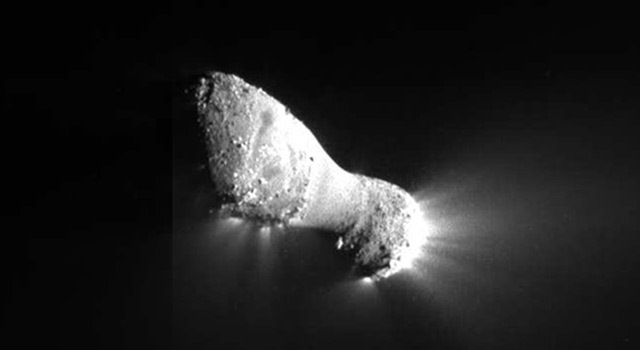 This situation left NASA's short list as a list of one -- comet Hartley 2. So Malcolm Hartley did what anybody would do who has a namesake comet that was just selected as a target for a NASA comet flyby, after the previous selection had disappeared. 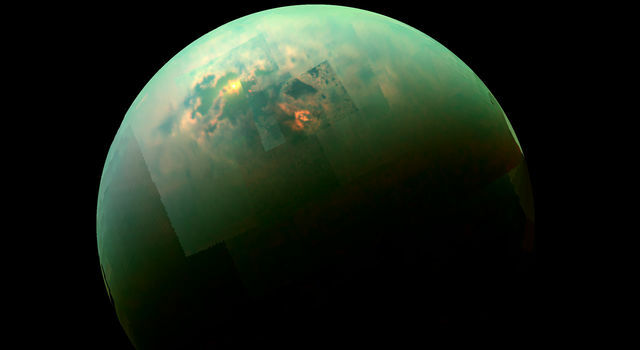 He thanked the reporter, logged off his computer and wondered what "his comet" would look like. Whatever that was going to be, Hartley was sure he would find out from the comfort of his living room. Then NASA called. "I've never been involved with a space mission," said Hartley. 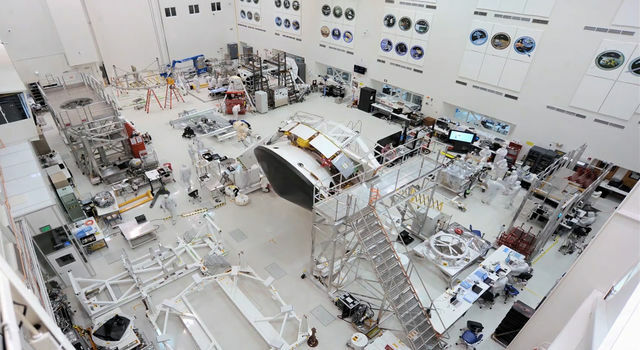 "I had never visited JPL or any NASA facility for that matter. So this is all new to me. I am very grateful you have asked me to come and witness this. It is an experience very few people have had before." Exactly once before -- of all the approximately 3,800 known comets, four have been imaged closeup by spacecraft. 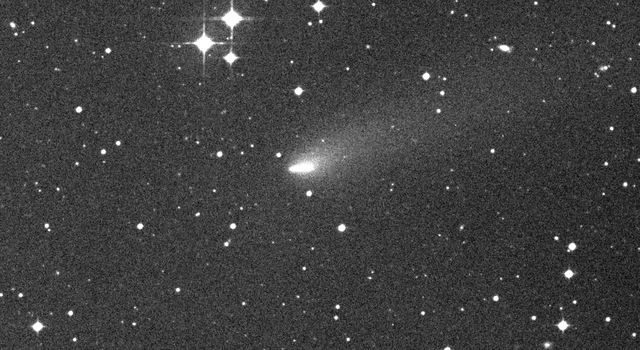 And of those four, only Swiss astronomer Paul Wild (pronounced "Vilt") was alive to see his comet visited. And while Wild witnessed the launch of NASA 's Stardust spacecraft from Cape Canaveral, Fla., in 1999, he watched the close-up images of his comet from the comfort of his living room in 2003. (Wild passed away in 2008). Hartley will see his comet from JPL's mission control room. "When I discovered the comet in 1986, I never envisaged that I would come to the location where the mission was run, to see it up-close and personal," said Hartley, who was a boy when JPL was starting up. Not surprisingly, the 63-year-old astrophotographer also has some thoughts on the mission to his comet. "You went to Tempel 1, but then you reconfigured the spacecraft for the extended mission," said Hartley. "That's pretty clever stuff that you've done. That's the kind of science that's really interesting. To be able to do something extra on top of the successful mission you mounted at Tempel 1, it's really special." EPOXI is an extended mission that utilizes the already "in-flight" Deep Impact spacecraft to explore distinct celestial targets of opportunity. The term EPOXI is a combination of the names for the two extended mission components: the Extrasolar Planet Observations and Characterization (EPOCh), and the Hartley 2 flyby, called the Deep Impact eXtended Investigation (DIXI). For more information about EPOXI, visit: http://www.nasa.gov/epoxi and http://epoxi.umd.edu. 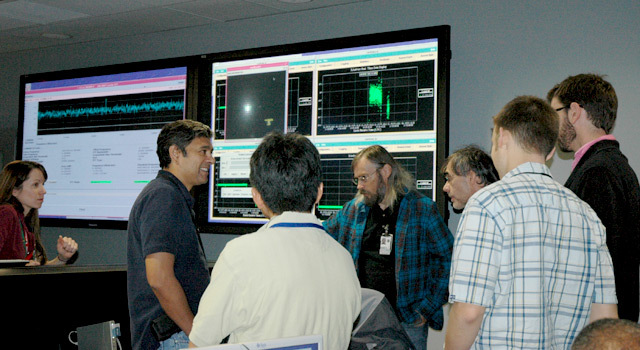 JPL, a division of the California Institute of Technology in Pasadena, manages the EPOXI mission for NASA.